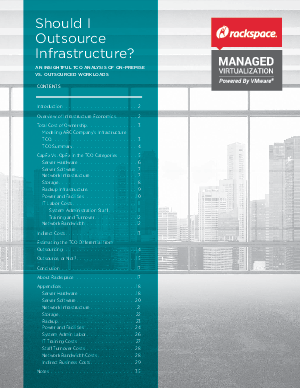 > Rackspace > Should I Outsource Infrastructure? The question of whether or not to outsource IT has evolved dramatically, especially in infrastructure. In addition to basic colocation, there are now hosted private clouds, public clouds, and hybrids to consider. But the fundamental questions about outsourcing, remain the same: Will this make business sense? What are the investments, expenses, and payoffs? This white paper aims to help businesses address these fundamental questions, based on a Total Cost of Ownership (TCO) modeling methodology built from Rackspace’s extensive experience working with IT organizations of all sizes, in order to make an informed ROI assessment. The best outsourcing decisions arise from gaining a thorough understanding of actual costs required to run infrastructure in-house. Some key factors—among many others—include the costs of facilities, server hardware, server software, network infrastructure and backup infrastructure equipment, IT labor, bandwidth, and various indirect costs such as the cost of planned and unplanned downtime. Another important consideration is the difference between capital expenditures (CapEx) and operational expenditures (OpEx), because each is subject to different accounting rules and reflects different values to the business. With an accurate TCO analysis, provided through Rackspace’s customized Alinean methodology, organizations will be able to make outsourcing decisions using numbers that are true and relevant to their specific company situation.